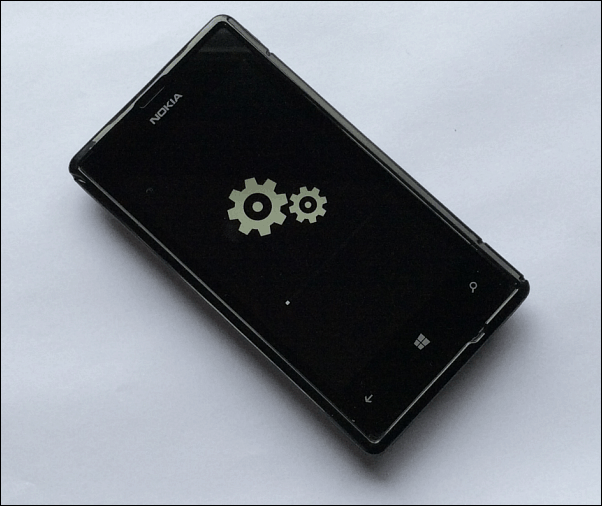 Windows Phone 8.1 has a critical update for users in the Preview for Developers Program. It was launched late today and is available to download now. 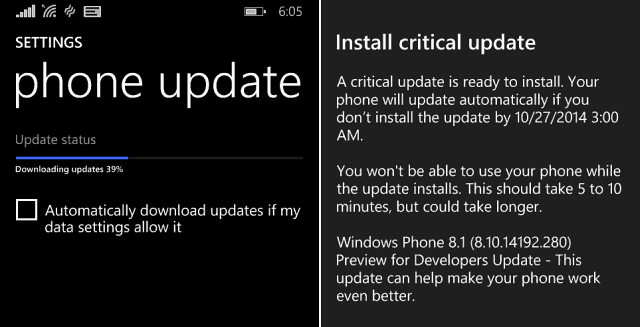 Windows Phone 8.1 has a critical update (8.10.14192.280) for users in the Preview for Developers Program. It was launched late in the day on Thursday of this week, and is available to everyone in the program. Remember that the Preview for Developers program is for…well developers…and also enthusiasts and early adopters. The program is free, and we showed you how to join earlier this year to be one of the first to get this years Windows Phone 8.1 update. The thing to remember about being in this program is you will continue to receive all new updates and features before carriers (eventually) roll them out to regular customers. To get the update right away, go to Settings > Phone update > Check for Update. Then you can download and install it – your phone will reboot during the installation. If you do have any issues with your phone after the update, you’re encouraged to leave a comment in the Windows Phone blog here. I installed the update on my Nokia Lumia 635, and all-in-all it took about 20 minutes. I haven’t had much time to play with it, but I’m not noticing any glaring problems. What is your take? Have you noticed any improvements in performance, speed, or stability after this update? Or if you’re having any problems let us, and more importantly, the Windows Phone team know! Well, I did update and found out that it takes way more time to recognize all the apps installed on the SD card. Before it was almost instantly, now not at all. Lumia 520 Cyan on DP. Updated my 920 last evening and it seems the same as before the update. No worries here. I’ve never had a problem with an update on my HTC 8x on Verizon. However, I will say that the last couple of developer updates have made my phone kind of a dog. I have to reboot it completely at least once a week to make things respond in a timely manner. Me too! Since an developer preview last summer I’ve had this problem. I’ve been through a couple of updates since, and still no fix. I too must re-boot my phone a couple of times a day. Many times I have to try to open apps 4 or 5 times until they finally open without just sending me back to the start screen. Has anyone solved these problems? have you managed to install cyan on the Lumia 822?? I have found that the battery drain problem has been sorted as my 1020 is now lasting all day and not moving one bar. Can anybody tell me why I haven’t received any new updates on my Nokia Lumia 928 for developers preview? I have Verizon wireless as my carrier but from previous posts I can see at least one of you has had the update with Verizon. My current version is 8.10.12393.890 so im not sure if I received the update and didn’t notice because its on automatic. Please if someone could let me know It would be appreciated. I just got the update for my 928 on Verizon. Have you had problems with making phone calls? I press a contact and it will go silent for a second and then connect or it will not connect so I hang up and try again. Plus, I do have to reboot my phone once in awhile if the phone lags. I actually found out my problem it was because I must of accidently uninstalled the developers preview app. I just downloaded it and accepted the terms. Yeah I actually do have that happening frequently, I wonder if its just with that phone or is it other phones. I never thought much of it since it would eventually work. it is annoying though. I’ve updated my lumia 920…..looks same as before….may be some critical & minor fixes…..
After i installed this ‘critical update’ more than half of my installed apps don’t work! Apps like facebook, one drive, facebook messenger, xbox music, calendar, battery app and so on. I have a lumia 520. What do i do? I really don’t want to reset the phone. After installing the new update for my device Lumia 620, it doesn’t stop rebooting again and again and I barely can use any application. Please could anyone contact the Developers to amend this ASAP! My 520 is updating for last 12 hours with no resond at all wtf ??? My 635 has been updating for the past 12 hours with no response how do I resolve this?